FIFA president, Gianni Infantino, has said that Nigeria will become one of the top footballing nations in a few years. Infantino argued that Nigeria’s current position in FIFA ranking, does not reflect the massive pool of talent in the country. He insisted that the future will be better. 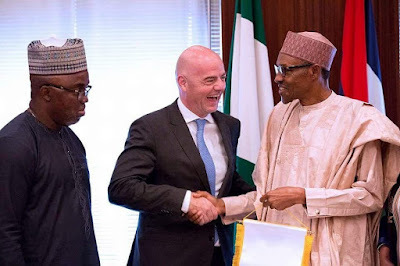 “I have seen that Nigerians’ passion and love for football is high, high up there and with the developmental programme the Nigerian football authorities have in place, I see Nigeria moving up to challenge the best in the world,” the FIFA boss stated. “As World Cup Under-17 defending champions, Nigeria’s future is very bright if the talents are properly monitored and managed. I see a bright future for the game in Nigeria and I also believe the managing of the game is in good hands with the present leadership of Nigerian football”, he added.